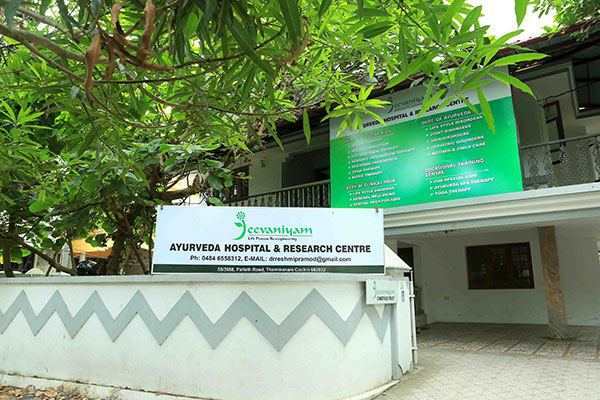 Jeevaniyam Ayurveda has always strived to provide the best possible Ayurveda therapeutic care to the patients suffering from various ailments such as Rheumatic Diseases, Arthritis, Back Pain, Metabolic Disorders, Woman and Child Health Issues, Skin Diseases and much more. Basing the diagnosis on the Tridosha concept of Ayurveda and adhering strictly to the prescribed Panchakarma procedure with perfect Poorvakarma (preparatory procedures) Pradhanakarma (cleansing, purifying and detoxification) and Paschatkarma (recuperating and nourishing) our efficient team of doctors, therapists and dieticians u completely re-engineer your life into healthy happy days. The therapies offered at our centres are Marma Therapy, Abhyangam, Podikizhi, Elakizhi, Narangakizhi, Kadikizhi, Muttakizhi, Navarakizhi, Pizhichil, Dhara, Snehapanam, Swedanam, Vamanam, Virechanam, Vasthi, Jalookacharanam, Rakthamokshanam, Uttaravasthi, Pichu, Thalam, Lepam, Upanaham, Kateevasthi, Sarvangha dhara, Sirodhara, Mukha lepam (face packs), Talam, Nasyam, etc. The treatments are solely as per the advice of the doctor and may depend upon the constitution and health analysis by the consulting Doctor. We offer 3-5-7-10-14-21-28-35 days Ayurveda Treatment Programs of cleansing-detoxification Panchakarma Therapy, Relaxation-Rejuvenation Treatments, Stress Management Therapy, Weight Reduction Therapy, Infertility Treatments, Ante-natal Care, Post-partum Care, Immuno-boosting Rasayana Therapy, and Aphrodisiac Vajeekarana Therapy. Based on the health condition of the patient and considering various other factors Shamana (palliative) or Shodhana (purificatory) treatments for both chronic and acute ailments are performed under the supervision of qualified Ayurveda Physicians after a complete health analysis.